DA Form 5187 - also known as the "Application For Respite Caregivers" - is a Military form issued and used by the United States Department of the Army. 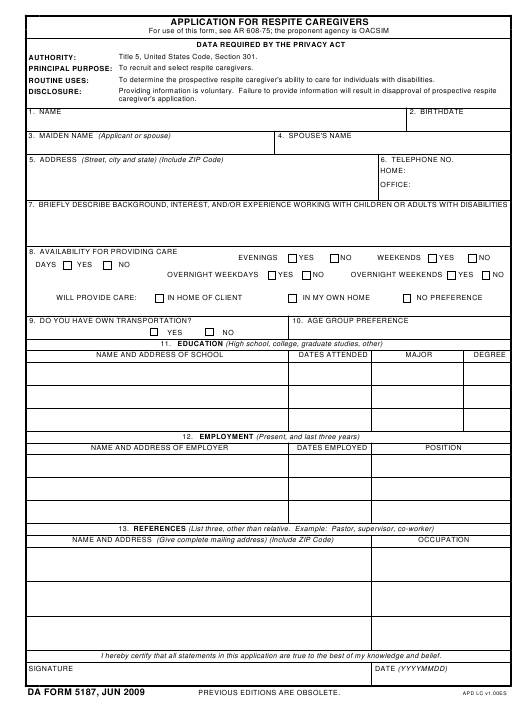 The form - often mistakenly referred to as the DD form 5187 - was last revised on June 1, 2009. Download an up-to-date fillable PDF version of the DA 5187 below or request a copy through the chain of command. Title 5, United States Code, Section 301. To recruit and select respite caregivers. To determine the prospective respite caregiver's ability to care for individuals with disabilities. 9. DO YOU HAVE OWN TRANSPORTATION? I hereby certify that all statements in this application are true to the best of my knowledge and belief.